If any fuel was made for the modern farm, it’s propane. It won’t degrade over time, and does not contaminate soil or water like gasoline or diesel. The risk of fuel theft is minimal. Additionally, it gives you portable power when and where you need it. Another advantage of propane is its reliability. Propane will keep you in business even when power lines are down, protecting your food and crops and production processing. Plus, propane burns clean and is “green” environmentally. Since farm and agriculture operations generally consume more propane than residential customers, Poore’s offers special high-volume discounts for our agricultural clients. We also provide you with convenient bulk delivery of propane to farms of all sizes, as well as convenient payment plans to help keep your fuel costs manageable. You can also count on Poore’s to back our products with highly trained service technicians who are rigorously trained in safety procedures. We provide reliable and timely deliveries and, for our automatic customers, 24/7 emergency service. From heating for your facilities with underground or aboveground tanks, to powering your generators, Poore’s will keep your agricultural business growing! 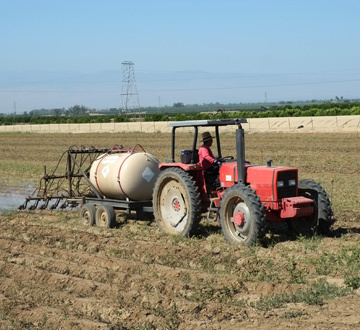 Using propane for your agricultural business? The Propane Farm Incentive Program currently offers up to $5,000 toward eligible propane agricultural equipment. Contact us to learn more.